Linda J. Ferrier-Reid, Ph.D., Chief Linguistics Officer, Phonologics, Inc.
Robert Mac Auslan, Ph.D., Vice President, Academic Operations, Phonologics, Inc. Doctor Robert Mac Auslan is also a professor in the IALC at Washington State University. Joel Mac Auslan, Ph.D., Chief Technology Officer, Phonologics, Inc. Joel Mac Auslan is also the founder and President of Speech Technology and Applied Research (STAR). Rita Mac Auslan, Ph.D., Director, Customer Relations, Phonologics, Inc.
Rita Mac Auslan is also an adjunct professor at both Southern New Hampshire University’s ILE and Manchester Community College. The purpose of this article is to describe the current version of the Automated Pronunciation Screening Test (APST), a computer-based test that analyzes digitized speech samples from Non-Native Speakers of English (NNS) who speak with a foreign accent, providing a norm-referenced intelligibility score. We also briefly describe a validity test we conducted on APST results using human judges. APST was developed to screen large numbers of NNSs quickly and objectively, such as international teaching assistants to determine if they should be allowed to teach, or call-center employees whose intelligibility is critical. It measures the intelligibility of such speakers to American English listeners. It does not measure other aspects of accent such as vocabulary and grammar. Other tests generally used for this purpose frequently rely on human judgments of different dimensions of speech intelligibility. Such rating scales are subjective, time-consuming and often inaccurate. It is intended primarily for institutional use. Technologically, APST is built upon knowledge-based speech analysis, acoustics, and the physiology of human speech production. The phrase knowledge-based refers to a system that is based on the careful study and analysis of the target; in this case, non-native speech. Two key components of such a system include a knowledge base (derived from the expertise of a human “domain expert”) and inference mechanisms (a decision or classification engine). It was developed initially with support from NIH and more recently from private investors. In its current version, APST is suitable for adult and high-school age users, and we are currently carrying out research on its applicability to junior high level students. The test includes a recording component, the APST Recorder, that is downloaded onto the user’s PC, either Mac or Windows, and a web component, the Phonologics scoring engine, to which spoken recordings are up-loaded and scored. These scores are then returned very rapidly to the test administrator as either individual or class/group scores. APST takes from seven to fifteen minutes of speaker time, depending on how cautious the speaker is. There is also a final test of validity in the scoring engine to determine if the recording was inadequate due to recording conditions. The scoring engine provides an overall score with ranges that can be used for placement purposes and five sub-scores that have some diagnostic functionality. Before beginning to use APST with multiple test-takers, the customer and Phonologics staff work together to install, test, and validate the APST Recorder on each computer to be used. Once this has been done, testing can begin. The test is designed to be given in a quiet, preferably enclosed area using a headset. When the test-taker double-clicks on the APST Recorder icon, the Phonologics logo will appear followed by the APST Login screen, and then the test screen. 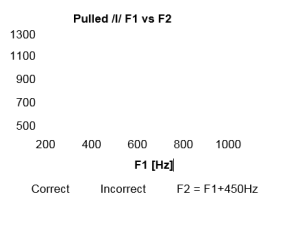 Following test-taker information, initial testing allows speaker volume or microphone/headset setting adjustment. Then the test begins. The words and phrases recorded while “This word or phrase is for practice only” is visible are not scored. The test-taker clicks the Record button, which then turns to Stop, and repeats the word on the screen once the blue timing bar appears. He/she can control the recording by using the Stop button to stop recording or let the time run out. For each word or phrase, the test taker can press the Go Back to Prior Word button once and rerecord. When “This word or phrase is for practice only” disappears, the scored test has begun. When the test is finished, the Test Completion screen appears. When the test-taker clicks OK, an optional survey is displayed. The test-taker can take the survey and click Complete Test or just scroll to the end and click Complete Test. When the Congratulations notice appears, the test-taker can close the screen. The Test Administrator will be sent an email with instructions for retrieving the test results from the online Administrator’s Console. Scores can be reviewed online or downloaded either as individual scoresheets or a combined (group) scoresheet. An interpretation sheet for the scores is included with the scoresheets. APST is valid for use with all NNSs of high-school age or over. It is in use both academically and commercially. APST is used both to determine an applicant’s qualifications for a job requiring spoken American English (such as a health-care provider or teaching assistant) or for placement in language classes. It is being used both for placement determination (does this student need spoken language training?) and to show progress. Will the current version of APST and the judgments of a small group of naïve Native English Listeners agree on whether preselected speakers are most intelligible, least intelligible, or in the middle of the intelligibility range? Will APST results agree with 1) intelligibility ratings and 2) position rankings of a small group of naïve American English listeners who listen to digitized recordings of sentences produced by NNSs? Sentence Intelligibility (i.e., the number of words in sentences heard correctly) correlated highly with rating scales of intelligibility (nine-point anchored scale) in sentences by naïve listeners. Listener-provided rankings of NNSs that can be used to sort speakers into most intelligible, least intelligible, and mid-range. Five native speakers of American English, consisting of four untrained listeners and one trained pronunciation coach, listened to four sets of recordings in order to evaluate (using a nine-point scale) and rank (top/middle/bottom) their overall intelligibility. The recordings consisted of one Spanish male (SMJPA5) with a mid-range intelligibility score from the APST, two Chinese females, one with a very high score (CFJLO5) and the other with a very low score (CFXLO9), and one male native speaker with a very high APST score (EMSGA21). The APST ranking is thus EMSGA21, CFJLO5, SMJPA5, CFXLO9. On both measures, the evaluators all rated the recording subjects in a fashion consistent with their APST scores. 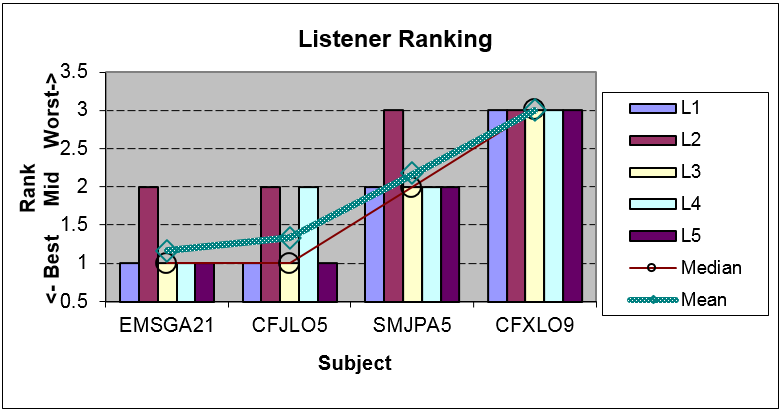 Using both the nine-point scale and the T/M/B ranking system the research team tested for the likelihood that listeners would score subjects in a fashion consistent with the APST by chance. For both the T/M/B ranking system and the nine-point scale we were able to reject this hypothesis. We conclude from this study that the current version of APST correlates favorably with human judges and that our test is valid and may be used with confidence. Our findings are all the more remarkable due to their exact correspondence on the nine-point scale with the speaker ratings based upon their APST scores. Similarly the T/M/B ranking system also corresponds closely to the APST scores with one notable exception wherein a highly intelligible native speaker is given an M (Middle) ranking despite the same listener being given the highest possible score on the nine-point scale. We assume that this latter may have been due to a clerical error in recording the listener’s judgments. Robert Mac Auslan, Ph.D. Vice President, Operations, Phonologics, Inc.
English is the lingua franca of business, medicine, government, technology, and many other industries; and the need to speak intelligibly is increasing across the world with the expansion of global business. Therefore, the poor intelligibility of non-native speakers is a problem in both the academic world and in the workforce. In order to train for better intelligibility, we need to be able to quickly and accurately judge that intelligibility. Human judges of intelligibility need extensive training and their judgments are often biased and inconsistent. Technology is stepping in here to provide quicker and more objective ratings of speaker intelligibility. This article introduces a variety of such technologies available today and the areas in which they are particularly critical. Miscommunication can occur in any human interaction, as medical institutions know to their cost. Anecdotes of such miscommunications are very common, particularly in the airline industry, where the results can be fatal. Communication in the air is generally carried out in English. Indeed, nothing underscores the subtle complexities of speech communication more strikingly than the mis­communications that occur among pilots, crewmembers, and air traffic controllers. When different words or phrases sound exactly or nearly alike, it can problematic. Confusion is possible, for example, because “left” can sound very much like “west”. According to a Federal Air Surgeon’s Medical Bulletin, entitled, Thee…Uhhmm…Ah… , ATC-Pilot Communications, “When you produce these hesitations while speaking, you are using … ‘place holders,’ or ‘filled pauses’, a type of speech dysfluency especially common in pilot-controller exchanges”, says Mike Wayda. Until recently, such speech dysfluencies and other mistakes were not considered to be important; however, new research suggests that there is a correlation between miscommunications and mistakes. What is a “Foreign Accent”? We are interested in foreign accent to the extent that it reduces intelligibility. (We concentrate only on pronunciation and ignore vocabulary and grammar.) Non-native speakers are often unintelligible because the speech patterns of their first language interfere with their pronunciation of American English. Indian speakers, for example, often substitute /v/ for /w/. Some languages, such as Mandarin Chinese, do not allow obstruents (sounds created by restricting air-flow through the oral cavity) at the end of a word or syllable so the final consonant is omitted – in the word “rice” the final /s/ sound is left off. In some languages the /t/ sound is produced more like a /d/. This can lead to meaning confusions such as English listeners hearing “die” instead of “tie”! Prosodic effects are also important. Prosody covers a number of systems that affect intelligibility, including intonation, and sentence stress or accent, determined in English mostly by the speaker’s focus and whether this is the first mention of an item to the conversation. Unfortu­nately, there are few simple rules to guide the learner of English; word stress patterns must generally be learned on a word-by-word basis. In addition, speakers of tone languages, such as Chinese and Korean, have difficulty carrying an uninterrupted pitch contour over an utterance and assigning correct sentence stress to the most important word/s in a sentence. To the ears of native speakers, their productions sound “jerky”. How Did Speech Assessment Evolve? Initially, all speech testing relied on the judgments of a human listener, who is, of course, prone to fatigue, bias, and unreliability. This is probably still the most common way to evaluate speaking effectiveness and intelligibility. Speakers are evaluated in reading, responding to prompts, or in free conversation. The Speaking Proficiency English Assessment Kit (SPEAK) is an oral test developed by the Educational Testing Service (ETS) and perhaps epitomizes the traditional way of evaluating speech. Its aim is to evaluate the examinee’s proficiency in spoken English. ETS developed the four skills (listening, reading, speaking, and writing) TOEFL iBT test. 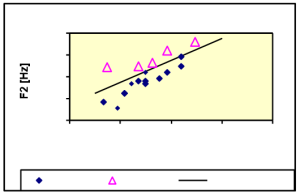 The Speaking portion of the test is scored by human listeners and, according ETS, has undergone extensive statistical and reliability analysis. The Speaking section of the TOEFL is not available separately from the other sections, but institutions wishing to test speaking skills only may choose to use the TOEIC (Test of English for International Communication) Speaking Test, also developed by ETS, and available as a stand-alone assessment. Since acoustic analysis methods became readily available in the 1960s, there has been a steady stream of research documenting particular features of standard American English speech in single words and sentences and, more recently, of non-native speech, allowing comparison of the two. 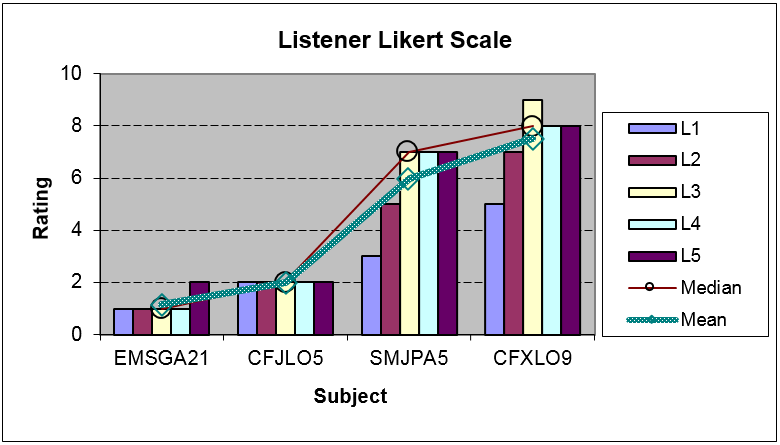 These studies have allowed the computer analysis of speech in programs such as the Versant Testing System, Carnegie Speech Assessment, and the Automated Pronunciation Screening Test (APST). These use large-scale statistical studies on native and non-native speech as the basis for assessments. Because of the difficulty of training listeners to achieve reasonable reliability with each other, and the time it takes to score spoken tests, computer-based testing offers the hope of more rapid and reliable intelligibility assessment. The three tests noted above that use computer analysis, are further described below. Rapid assessment of spoken English by analyzing each student’s speech against a statistical composite voice model of native speakers. Self-directed tutorials that reduce administrative requirements and costs. Tunable grading scale customizes results to each organization’s operational or educational requirements. Immediately available and objective reports that can be compared across multiple applicants as well as across the business and educational enterprises. APST uses knowledge-based speech analysis and is based on the careful study and acoustic analysis of the target — speech. It is designed to test large groups of non-native speakers quickly, accurately, and objectively. Speakers first practice recording items and then read words and sentences, which are recorded into the computer. These recordings are sent to Phonologics via the web, where they are automatically scored and a report is made available to the test administrator within minutes. 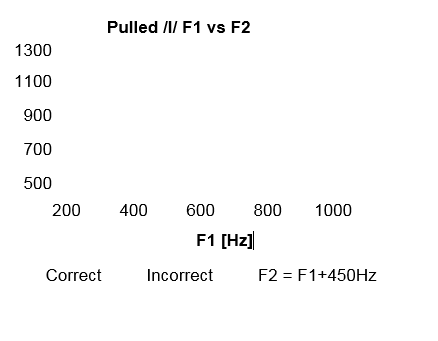 The test provides sub-scores on particular aspects of speech and a summary score that indicates the intelligibility of the speaker to American English listeners. The initial human-scored version of APST was developed to screen the large numbers of non-native speakers at Northeastern University in Boston, MA. The program provided a summary and sub-scores and was used with standard TOEFL scores to determine whether international teaching assistants should be allowed into the lab or classroom or first receive intelligibility training. This first version showed the need for a more objective and quickly scored version of the test. A second automated prototype was developed with funding from NIH. Further development of APST has been under the auspices of Speech Technology and Applied Research Corp.
How Well Do Automated Intelligibility Tests Correspond with Human Judgments? These new technologies offer the prospect of accurate results that agree with the judgments of human listeners, but without the labor and time commitments, and with the promise of more objective results. This allows us to place speakers in classes or positions more quickly and accurately, and without the bias that unfortunately can often creep into the human-scored process. Communication in the air is generally carried out in English. Indeed, nothing underscores the subtle complexities of speech communication more strikingly than the mis¬communications that occur among pilots, crewmembers, and air traffic controllers. When different words or phrases sound exactly or nearly alike, it can problematic. Confusion is possible, for example, because “left” can sound very much like “west”. Prosodic effects are also important. Prosody covers a number of systems that affect intelligibility, including intonation, and sentence stress or accent, determined in English mostly by the speaker’s focus and whether this is the first mention of an item to the conversation. Unfortu¬nately, there are few simple rules to guide the learner of English; word stress patterns must generally be learned on a word-by-word basis. In addition, speakers of tone languages, such as Chinese and Korean, have difficulty carrying an uninterrupted pitch contour over an utterance and assigning correct sentence stress to the most important word/s in a sentence. To the ears of native speakers, their productions sound “jerky”.